Appropriate control of inflow rates and duration of irrigation is particularly relevant where overirrigation has to be avoided. This is the case when deep percolation of excess water contributes to water table rise, salinization, leaching of fertilizers and other agrochemicals, and excessive drainage volumes. Such control is also essential when irrigating saline soils or using saline water. Therefore, the improved control of qin and /co becomes not only a matter of irrigation performance but environmental protection. When the irrigator selects the best time for irrigating, and thus the best SWD, he may achieve the best performance when appropriate inflow rate and time of cutoff are selected and applied. Selection of the appropriate rates and times requires either simulation of the event, with appropriate input parameters, or experience. Applying the desired rates and times requires an ability to measure and control the flows in rate and time. Lack of water control at the farm and field level often constrains an irrigator's ability to do the job well. Good farm water control requires good water conveyance systems, such as buried pipelines, and often on-farm water storage so that irrigation rates and timings are not completely determined by water supply rates and timings. Good field control requires the ability to adjust and control field inflow rates and to provide uniform discharges along a furrow-irrigated field. Good field application systems include the use of concrete channels with siphon tubes for furrows or side gates for borders and basins; the use of surface gated pipes or lay-flat, flexible tubing equipped with appropriate regulation valves or orifices for furrows; and buried pipelines with valved risers for basins and borders. This equipment, although more expensive than traditional earthen ditches, is easy to operate, less labor intensive, and provides more precise control. Further advances in control of qin and 4o are obtained through automation. A primary disadvantage of surface irrigation is the labor requirement. Engineers have worked for many years to develop automated, or at least mechanized, surface irrigation systems. Humpherys  describes many of the systems that have been developed and tested in the past 50 years. Two recently developed mechanization systems for surface irrigation that can reduce labor and improve water control have seen modest adoption: cablegation (Fig. 5.18) and surge flow. 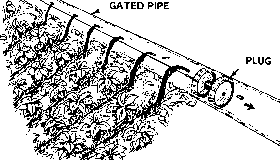 Cablegation  automatically applies a gradually decreasing inflow rate to furrows from gated pipes. Considering that infiltration rates also decrease with time, this can be a great advantage in decreasing both deep percolation and tailwater runoff losses. When properly designed, installed, and managed, cablegation systems can provide good irrigation performance. An example with blocked furrows is presented in Fig. 5.19. Field evaluation during irrigation provided information to reduce the inflow rate and increase the time duration of the subsequent irrigation. This resulted in increasing DU and ea. Figure 5.18. 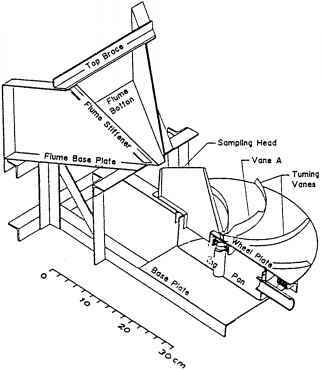 Cablegation system for furrow irrigation. Figure 5.19. 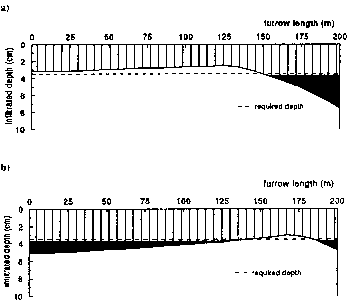 Infiltration profiles in a blocked furrow with a cablegation system: (a) irrigation on 08/21/92, with DU = 73.7% and ea = 73.4%; (b) irrigation on 09/15/92 after decreasing the inflow rate and increasing the cutoff time, with DU = 80% and ea = 80%. Source: . Figure 5.20. Cablegation for automated level-basin irrigation. obtain uniform applications along the pipe. Because of low-pressure flow in the pipe, the outlet flows are greatly influenced by the relative elevation of the outlets. The cablegation concept also has been adapted to borders and level basins . Water is delivered through underground pipes and applied through large open-topped risers. A cablegation system currently used for level-basin irrigation at Coruche, Portugal, is shown in Fig. 5.20. Figure 5.21. Programmable surge valve. conditions and cannot be accurately predicted. Commercial programmable surge valves are available to automatically cycle the water between two irrigation sets (Fig. 5.21). Thus, surge irrigation can decrease labor (irrigate two sets at one setting), improve distribution uniformity (faster advance), and reduce runoff (quasi-cutback flows) [50, 54-56]. For both cablegation and surge irrigation, appropriate combinations of inflow rate and cutoff time are required for good performance. Thus, at least some field observations are required. Specific evaluation techniques are available for both cablegation , and surge irrigation . Surge irrigation performance also can be simulated with several surface hydraulics models, if the surge effect on infiltration can be predicted. Results of surge field evaluations often report improved advance time and infiltration rates  and decreased deep percolation and tailwater runoff [59, 60], at least for the first irrigation. Surge flow also may apply to graded borders. Appropriate filters should be used when automated irrigation is used in areas where water carries trash and algae, which could cause plugging of outlets and malfunctioning of the system . Several automation devices have been developed for level-basin irrigation, mainly for timer-activated automatic field outlet gates [62-64]. Very little surface irrigation mechanization has been adopted, for two primary reasons: First, because infiltration varies throughout the season, and surface irrigation performance depends very much on the infiltration rate, it is difficult to accurately predict the required inflow rates and irrigation times. Thus, good performance requires either feedback control from field sensors or human monitoring and adjustment. Feedback control is expensive and complex. Human monitoring reduces the labor-saving benefits of mechanization. Second, few private companies have been willing to invest in developing, testing, and marketing surface irrigation mechanization devices. Surface irrigation systems generally do not require sufficient system-specific hardware to merit large private-sector investment. Because surface irrigation performance is very dependent on infiltration , soil management plays a crucial role in efficient irrigation. Management practices can be used to increase infiltration of soils of low infiltrability (deep tillage, cultivation, controlled traffic, residue incorporation, residue management, reduced tillage, gypsum amendment, polyacrylamide amendment); reduce infiltration of soils with excessive infiltration (compaction, surge irrigation); improve soil water storage to allow larger, more uniform irrigations (organic-matter incorporation); improve soil aeration (drainage, deep tillage); control soil crusting and sealing (residue management, gypsum amendment); and reduce soil erosion (irrigation management, residue management, reduced tillage, polyacry-lamide amendment) . A common problem in furrow irrigation is high infiltration rates after primary tillage. Several studies have shown that furrow compaction of newly formed furrows can reduce infiltration by up to 50% [66-68]. Furrow performance also may be affected by furrow shape, uniformity, and roughness. Therefore, the selection of furrow opener systems should consider the capabilities for furrow forming, smoothing, and firming. Laser control of the depth of the furrowing tool has been tested as a means to improve furrow uniformity . Conventional tillage practices can destroy precision leveling. Alternative tillage systems, including reduced tillage and no-till can extend the life of a level field surface. However, modifying soil tillage practices impacts infiltration. Sealing may have negative or positive impacts according to soil type [53, 70]. Reduced till may have contradictory effects. Both a slight decrease and a large increase of advance time are reported when rotary till or minimum till is compared with moldboard plow. Contradictory results also have been obtained when application efficiencies were compared. Because of the variation in soil types, it is sometimes difficult to predict the effect of changes in tillage and other soil management practices. Fertigation (and chemigation) currently is applied with microirrigation and sprinkler irrigation, particularly with automated systems  but it is rare with surface irrigation. However, fertigation may be used for both furrow and basin irrigation when good irrigation uniformity and performance can be achieved. When chemicals are applied in surface irrigation water, backflow prevention devices must be used at any groundwater or public water supply, and any tailwater should be captured and reused, preferably on the same field. Recent studies show the technical feasibility of fertigation with surface irrigation. An experimental study  to analyze the variation in concentration of urea fertilizer in an irrigation supply channel show that injection must be done about 7 m upstream of the first field outlet when flow velocities are low (near 0.3 ms-1). Best mixing occurs when the injection is made in the stream centerline. Results also indicate that, for current irrigation practices, the fertilizer concentrations are uniform along the supply conduit. These conclusions also may be valid for gated pipes or lay-flat tubing. Santos et al. report that distribution uniformity of irrigation water is closely followed by the distribution uniformity of nitrogen fertilizer in level-basin-irrigated maize in a silty loam soil. The application of fertilizers with each irrigation improves fertilizer use by the crop and decreases the amount of nitrate in the soil after harvesting . Although more studies are required, there is evidence that surface irrigation fertilization can reduce the environmental impacts of nitrates. The purpose of irrigation scheduling (see Section 5.3) is to apply the appropriate irrigation depth when the SWD is less than or equal to the MAD. Scheduling of irrigations is essential to attain high application efficiencies [Eq. (5.139)], to avoid deep percolation and runoff losses of water and chemicals, and to prevent stress of the crop. Scheduling is of particular importance for management of saline soils or where low-quality water is used, so that the appropriate leaching fraction is given; for conditions of water scarcity, where wasted water is costly; and where drainage is poor and excess applications cause a high water table and poor soil aeration. Scheduling surface irrigation is difficult for three reasons: (1) It is often difficult to quantify the amount of water applied, (2) it is difficult to quantify the uniformity of the application, and (3) water deliveries from irrigation water suppliers often are not under the farmer's control. Quantifying water application requires flow measurement. If water runs off the field, both inflows and outflows must be measured. Flow measurement of canal water supplies is often inadequate or completely lacking. Runoff is seldom measured. Without flow measurement to quantify applications, schedulers usually assume that the root zone is completely refilled with each irrigation. This may be a poor, and costly, assumption. Flow measurement is critical to good irrigation scheduling and irrigation performance. 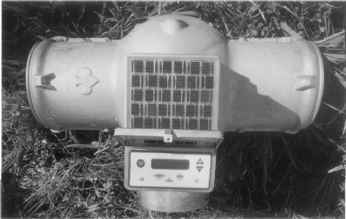 Methods to measure irrigation water are widely described [76, 77]. Because distribution uniformity in surface irrigation is dependent on complex interactions of parameters, and on inherently variable infiltration characteristics, water application uniformity is difficult to predict. Knowledge of DU is necessary to adjust total applications to the effective (usually low quarter) application amounts used for scheduling. Knowledge of the spatial application variability is important to select locations for soil water measurements. Because uniformity and variability are difficult to predict or measure, precise scheduling of surface irrigation is not possible. Overirrigation, although costly in terms of water wastage, effectively reduces water storage variability and facilitates scheduling. Most surface-irrigated areas are supplied from collective irrigation canal systems. Farm irrigation scheduling depends upon the delivery schedule, for example, rate, duration, and frequency, which are dictated by the system operational policies. Flow rate and duration may impose constraints on the volume of application, and supply frequency may constrain, or even determine, the irrigation timing. In general, surface irrigation delivery systems are rigid and the time interval between successive deliveries is too long. Irrigators tend to compensate for this by applying all the water they are entitled to use. For deep-rooted crops and soils with high water-holding capacity, this strategy can be appropriate; however, for shallow-rooted crops and/or coarse-textured soils, percolation losses can be substantial and crops may be stressed by alternating drought and waterlogging. Under rigid delivery schedules, it is difficult both to modernize the irrigation methods and to implement irrigation scheduling programs. Several papers in Smith et al. discuss technical, social, and organizational problems of rigid water-supply schedules and possible solutions. In general, it is difficult to apply small irrigation depths by surface irrigation, especially early in the season when the infiltration rate is high and roots are shallow. In furrow irrigation, the time of cutoff usually should be longer than the advance to provide for sufficient infiltration opportunity time. This implies that surface irrigation applications are usually large, which makes this method more suitable for situations where SWD and MAD are relatively large. Under these circumstances, scheduling can be simplified when adopting simple irrigation calendars . This is also advantageous for collective system management and for introducing improved tools for controlling the flow rates at the farm level. An example of development of irrigation scheduling calendars for basin irrigation that takes into consideration the system constraints is presented by Liu et al. . When the user is in control of the delivery timings, or when an arranged delivery schedule is used, and when irrigation applications can be quantified adequately, it is appropriate to use irrigation scheduling simulation models to determine the soil water status using soil, crop, and meteorological data. Numerous examples of such models are available in the literature (e.g. [81-83]). The use of scheduling models in real time requires periodic field validation of soil water status. Irrigation also can be scheduled through regular monitoring of the soil-water or plant-water status. Soil samples analyzed with the feel method are appropriate for any situation. The use of soil water-monitoring devices is generally economical only for large fields and crops which can justify the costs of purchase and operation. The use of these systems requires the selection of an irrigation threshold corresponding to MAD [see Section 5.1, Eq. (5.88)]. Observations or estimations of the SWD have to be performed regularly to track changes in the SWD and allow the prediction of the irrigation date when SWD = MAD. Furrow irrigation poses a special problem for soil water monitoring in that water distribution varies with distance from each furrow, and so, representative sampling locations and depths must be determined and assumptions must be made about the effective MAD. A further degree of sophistication can be achieved by combining soil water-balance simulation with soil water measurements. This can be done in two ways: (1) soil water information is used to validate the model predictions, and (2) continuous soil water and meteorological monitoring are coupled in an irrigation simulation model. An example of the latter approach is presented by Malano etal. .